As the story goes, the day he was born, an owl flew into his room through an open window and perched on the side of his crib. An unusual event for any newborn, however a very prophetic event for Sri Lankan-born wildlife artist and nature conservationist Gamini Ratnavira. While this may have been Gamini's first direct link with nature, it wasn't until five years later when, fighting loneliness after his parents' divorce, Gamini observed the one event that would forever tie him to his life's passion. "It had just rained and I was outside feeling sorry for myself. I started to watch a raindrop roll off the edge of a leaf and I was fascinated by the colors and the movement of those colors in that tiny raindrop. Then it fell to the ground and was absorbed by the dirt to nourish the plants. It was at that exact moment that I realized how big, complex and all-encompassing nature really is. As I was thinking about all of this and how it all tied together, I realized that for the first time in months, I had completely stopped thinking about my family situation and was actually able to smile. That's the power of nature." 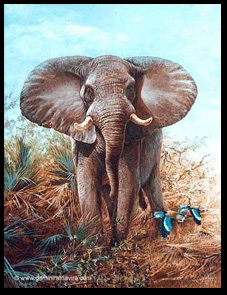 What followed is as predictable as a scene from Doctor Dolittle - birds, pythons and other snakes as pets, squirrels in his pockets and even a baby elephant living in his bedroom. He laughingly blames his photographic memory for getting him started in art. "I would recall images and scenes so vividly that I was literally bursting to find a way to communicate what I saw. My first paintings didn't resemble much of anything - but then again, I was only 5 years old. Thank God I got better." 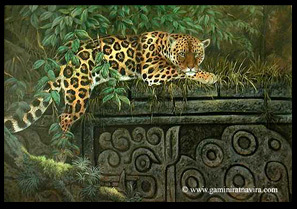 By the time he was 19 years old, and without a single lesson, Gamini's art was his sole means of support. Since then, Gamini has traveled to over 40 countries, viewed over 5,000 birds in the wild, led expeditions into the rain forests - including escorting then-President of the World Wildlife Fund (WWF) Prince Philip in 1986 - and has become a staunch supporter of over a dozen wildlife support organizations. Gamini's paintings have illustrated 38 national postage stamps for the country of Sri Lanka and the President of Sri Lanka commissioned Gamini to create a painting for the Colombo International Airport where it still hangs to this day. It's no wonder that Gamini was officially declared a National Living Treasure of the Country of Sri Lanka. 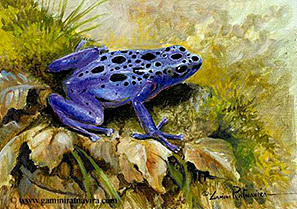 Even the Outdoor Channel recognized Gamini, who now makes his home in Fallbrook, California, as one of the top master wildlife artists in the USA. Gamini's work is also exhibited in shows across the United States and around the world. 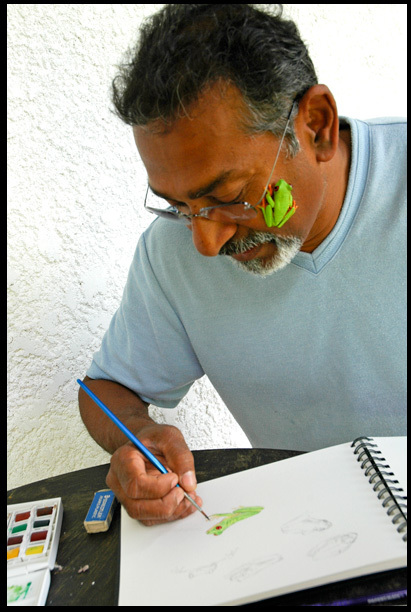 In addition to his photographic memory, Gamini believes that any nature artist must study his subject in great detail in order to bring it to life in his paintings. 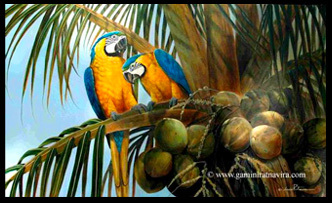 This belief has helped Gamini make the transition from being a purely wildlife artist to an artist who can capture the incredible nuances of a spectacular mineral specimen - yet another form of natural art. Gamini's history with the gem and mineral world dates back even beyond that fateful day when the owl landed on his crib. In Sri Lanka, the name "Ratnavira" translates as "Heroes of Gems" and that title was granted to his family as their caste, dating back several centuries, was that of the jewelers for the royal family. In fact, Gamini's father, Sardha Ratnavira, was the first Asian to qualify at the Gemological Institute of America (GIA) - then located in Santa Monica, California. And Gamini's grandfather would often take young Gamini along with him when he went mining in the Ratnapura (literally "City of Gems") district of Sri Lanka. Gamini would often help his father design award-winning jewelry and, in doing so, his study and appreciation of gems and minerals grew. As his portfolio of amazing mineral specimen paintings grew, he soon started attracting the attention of well-established mineral dealers like Bill Larson and Dr. Robert Lavinsky. The paintings currently available represent a series of paintings that were commissioned by Dr. Robert Lavinsky and the prints are presented here for the very first time. 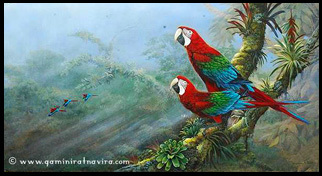 We invite you to browse through the paintings and enjoy the art that is Gamini Ratnavira. Click here if you'd like to place an order.